This year, I'm reading all the books we have (with some exceptions) before buying new books. It's been an interesting journey so far (slowed somewhat by my decision to read an issue of The New Yorker every weekday during Lent). 1. I have read several "just fine" novels in a row. One was for a book club; we picked it because it was by an author I'd long been interested in trying (and I got it from the library). The rest were already in the house and I'd picked them up on sale somewhere. They were...fine. Just fine. Some were Canadian; some American. All absolutely fine, but no more gripping/fantastic than that. I may read other work by these writers, but I'm not sure I'd buy it in hardcover. These are the kinds of books that gradually fall to the bottom of the stack because something shinier comes along. I'm happy to have read them, finally. Fine-ally, haha. 2. I read a short story anthology that was both tiresome and fascinating. I'm so glad I picked it up when I did (several years ago). I have added a few new authors to watch for; their work intrigued me. That part was very satisfying. I didn't love the anthology enough to keep it nearby, and I'm still not sure where it will end up (donate? at one of the camps? ), but I don't have to decide that this very moment. 3. Speaking of where the books end up: before this year, when I've finished a book but not known what to do with it, I have taken it to the little camp where my sister and I stay when she comes up for vacation, and where I sometimes go to hang out and read and write. This summer, my sister picked up, read, and opined upon several books from our camp's bookshelves (they've become part of the scenery for me). It was interesting to hear her perspective and realize just how few of those books I remembered. So I'm culling from there, too. It's definitely a convenient resting place for books when I don't need them in the house but am not sure I'm ready to get rid of them. 5. I read a novel by a famous "classic" writer from the 20th century and came away mystified. Again, this was for a book club, and I probably wouldn't have finished it otherwise (and I hardly ever give up on books). I'll look at a short story collection someday, but only one, and I'm not in a huge hurry to do it. Though I'm probably wiser for the experience of reading this novel, I'd have traded it for another "just fine" one. So far, I've thoroughly enjoyed the virtuous feeling I get from this "reading what I own" project, and I feel I'm learning as much by reading these selections as I would if I were chasing the newest "great reads." It's also made me a more considered consumer--as I hear of a new novel, I automatically think, "Would I really want that in the house?" I may even sign up for another year. But who knows--this final four-month period may make me long for something new and shiny again. The grocery store’s air conditioning provides a welcome respite from the heat after a full morning of errands. With every hot sidewalk and parched parking lot, I’ve dreamed of a cold mocha. As the barista makes my frozen treat, I hear a wail. Peering around the corner, I see her. A little girl, not too far from her second birthday, stands in the basket of a grocery cart, fists gripping the seat in which NO, she WILL NOT SIT. Her chubby cheeks flush as pink as her sundress. Tears or sweat, I can’t tell which, pull strands of curly hair down her neck. Her eyes squeeze shut and she inhales for another round. “Here you are, sweetheart,” a woman’s voice croons. “So hot, I know, but this will cool you down.” Nana (or Mimi or Grandma) holds a small carton of chocolate milk to the girl’s baby-bird mouth. With expert timing, Nana tips and straightens the carton, watching with a hopeful smile. The little girl swallows, widens her eyes, and opens her mouth for more. She bounces a dance in the cart, not yet appeased but willing to be. The barista slides my drink across the counter. Dark, sweet, smooth—the creamy coolness spreads through my torso, down my arms, across my forehead. I smile at Nana and return, refreshed, to the day’s heat. Fun. When was the last time your creative work (for me, writing) was fun? When I asked myself that question, I got the mental equivalent of that little spinning wheel thing that you see with "buffering." In other words: uhhh. Been awhile. This summer, I participated in something that was really FUN. And although it was related to art, not writing (or perhaps because of that fact), I feel more playful in my writing, too. What did I do? Index Card a Day: invented, managed, organized, and curated (and copyrighted) by Tammy Garcia over at DaisyYellowArt.com. The idea is that you somehow "decorate" an index card (either 3 X 5 or 4 X 6) per day, every day, starting June 1 and ending July 31. That's 61 days in which you take 5 or 15 or 65 minutes and cover the surface of an index card. * The result doesn't have to be pretty or art (whatever that means); it doesn't have to "work." The point is to create something every day for 61 days in a row. Process, not product. * Use highlighters, acrylic paints, makeup, watercolor, pen, pencil. Sew, glue, draw, paint, staple, whatever. * Tammy provides prompts and suggests media, but you don't have to use them. * There's a Facebook group to share your images if you want (I opted not to in order to keep the "fun" element alive and well for myself, though I shared them daily with my sister for the sake of accountability), and people were on Twitter, too. My sister has always created beautiful artwork: she draws (recently Zentangles, but she was drawing wee illustrated books for me for car trips back in the 1960s), she hand-makes books, she's made jewelry (both from purchased beads and from beads she made with polymer clay, pysanky, hand-tatted lace, note cards, halter tops (this was the 70s), and embroidered pillows. Among other things. As for me, well. I like pretty colors, and I have taken a drawing class, and I've thrown pots (which was also really fun in a wordless way), but really I'm a writer. So I went into this without any pretense of "art." Here's proof! One of my images: crayon resist w/ watercolors. 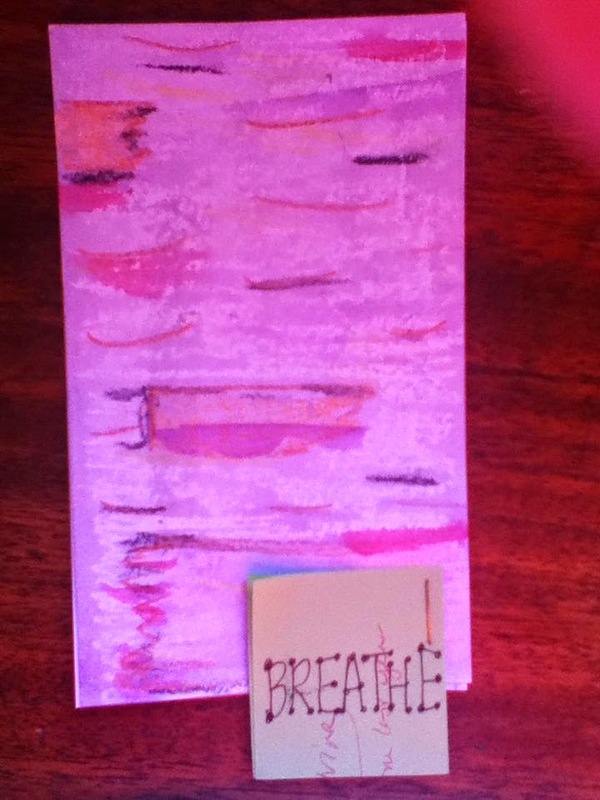 It's more or less supposed to look like birch bark (and the photo is from my iTouch and I was wearing a pink shirt, so colors are approximate). Anyway, the POINT of all of this is that I haven't had this much fun in I don't know how long. Being the rule-follower that I am, I deliberately let myself/forced myself to NOT follow ANY rules and so I did lots of index cards--collections and books of them. (I bought 300 and used roughly 250.) I compiled drawing done in the evenings when I was too tired to do anything more productive than drool in front of the TV (lots of pages of vaguely flower-shaped objects, as well as a series of lines in different colors); they became a three-dimensional "garden" and background images for other days. Early on, I had a light-bulb moment and "went outside the lines" of the index card horizontal space. Soon, I started building stuff out of index cards, too. That's ancient black elastic from my sewing box, duct tape "flowers", centers and leaves made from paint chips, over a card with designs meant to resemble storm clouds and wet weather, and cellophane at the top (remember how when you were a kid, "sky" was a blue strip at the top of the page? ), with staples as "design elements" representing rain. 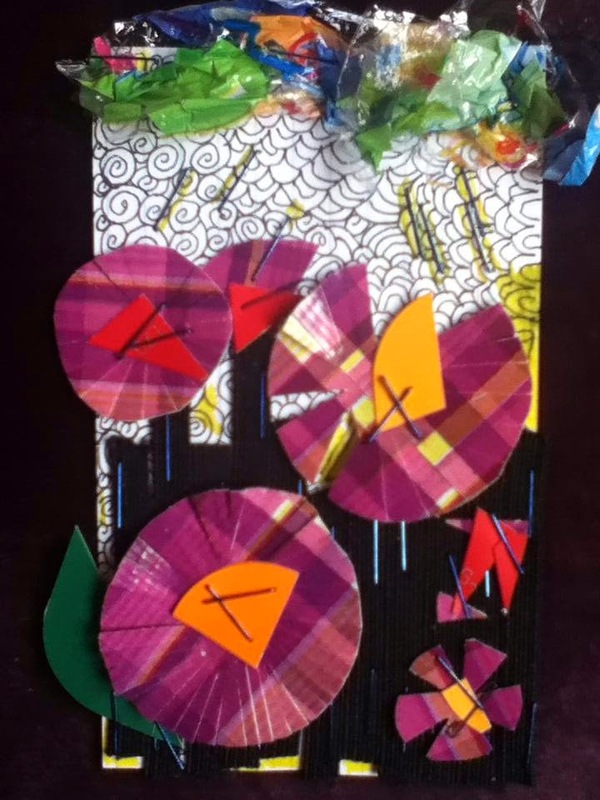 This was one I did after a few others relating to "grow," and I was so excited about making the flowers (plaid duct tape! circles! then cut so that they have petal-looking bits!) that I had a hard time sleeping. And yes, I wrote a lot this summer, too. I have been a little all over the place with it, rather like the gardens here after they get growing. Connections I might have missed before! Words! Thoughts of reasonable coherence! Words accumulating under fingers and under the tip of a pen! Green, growing, nutritious! That has been the best part of all: that the fun I had decorating one little card a day for 61 days is spilling over into my writing. So if you, too, just see that little spinning wheel when you think about "having fun" with your creative work, consider a bit of structured play in a medium that's not your primary one. Here's a link to what ICAD was all about. The 2014 ICAD-a-palooza is over, but mark your calendar for next year. For reals. And Tammy has a lot of other goodies going on over at Daisy Yellow, too.